VOLUNTEERING AT THE SALVATION ARMY ANGEL TREE REGISTRATION! 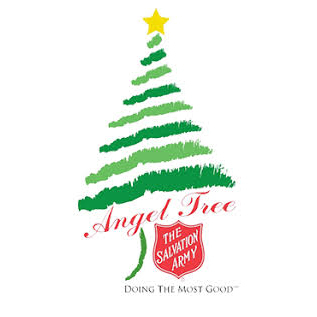 Most of us are familiar with the Salvation Army red kettles at Christmastime – but did you know the second most popular Salvation Army holiday effort is the Angel Tree program? Cards are placed on Christmas trees in various locations across America, outlining the needs of children at holiday time, and people wishing to donate can “adopt an angel” by purchasing the requested items. The items are bagged/boxed according to an assigned number given to each family. CLS partnered with Salvation Army at Angel Tree registration stations in various area malls this past weekend. CLS volunteers were charged with the task of assisting generous donors select printed cards contained the Christmas wishes that are hung on the “Angel Tree.” After the donors purchase gifts for the families, they are to return the gifts back to the Angel Tree location for further distribution.